Work, Career, Life Purpose - The Time of Light Psychic Readings, Zorica Gojkovic, Ph.D. Many of us deeply into spiritual growth are anxious about living our life purpose. We also live in a society that is goal oriented, rather than process oriented. So, we're under a lot of pressure to do things, do them fast and achieve. What I have discovered giving psychic readings is that we are all very unique and each one of us finds her calling at the right time for her. That may be early or late in life. ​Meanwhile, everything we do in life prepares us for that. You're a Young Person, How & Where Do You Start to Live Your Life Purpose? There are several things I have observed in psychic readings sessions with clients about work, career and life purpose. First, many young people tend to want to know their life purpose very early on. Much of the time, that is not possible. To come to know your life purpose is a process of couple of things, getting to know yourself and life experience. You get to know yourself by living life, being in different situations, and with different people. It's how you discover yourself and how you discover your talents and abilities. It is also how you gain life skills. So, if you're a young person, where do you start? You start by getting quiet and feeling -- what do you crave to do? What lights you up? What excites you? What do you long to try? What makes your heart sing? What opens your heart with love and joy? These longings, desires, wishes, excitements, loves are your soul talking to you. Following them leads you to your highest soul expression and your greatest fulfillment -- to your life purpose. For those of middle age, I have seen that sometimes it takes a long time to come to do your life's work. This is especially true if you are any kind of a healer or artist. There is generally a long learning curve: learning about yourself, remembering your soul knowledge, learning about how to operate in earthly life, and gaining skills and experiences. This takes a long time. But eventually, it all comes together, and it is wonderful to behold. So don't be discouraged if you find yourself of middle age and still "appear" to be fumbling around, trying to find your path. You're on the right track, just follow your heart and your passion. What I've also seen a lot lately is clients in their 50s and 60s changing careers completely. And healers who have being working in a certain modality, changing modalities. Most of the time these are old souls. They've gathered knowledge, come to know themselves, gained wisdom and experience and now they're putting it all together in a new endeavor or a higher expression of their gifts. Fantastic! If this is you, you have a lot of very important material to offer the world. Don't doubt yourself, step forward with confidence. The world needs you! We live a long time these days, and at 60 your main work may just be beginning. Most of the time clients think they have to change careers or find out exactly what they are doing -- in one step! From what I have seen in psychic reading sessions, that is almost never the case. Steps need to be taken -- and in order. This is very important. Start with step one, and keep going. You'll get there. You just need to understand it is a process. You grow with each step, have a different view of the territory, are a new person, and you then see the next step. That's how you move forward until you have found your place in life. I recommend this extremely well-written book on how taking one small step at a time can lead to huge achievements and huge positive changes in life. I highly recommend Johnson O'Connor aptitude testing service. If you're college bound, this test will give you comprehensive information about yourself and your natural talents and abilities. If you're unhappy with your current career or work and are looking to make a change, or just feel a little lost about what to do in life taking this test will be hugely illuminating and will help you decide in which direction to go. All around it's a fantastic tool to bring clarity and understanding about who you are, your talents and abilities and natural predispositions. The test is offered in major cities across the U.S.
Our purpose is hardwired inside us. Our feelings, desires and loves are meant to lead us to that expression--if we can feel them, and if we can trust them. Evening Peace is designed to continually put you in touch with your deepest feelings and desires and lead you to ever-great fulfillment. I like Tony Robbins and his work. 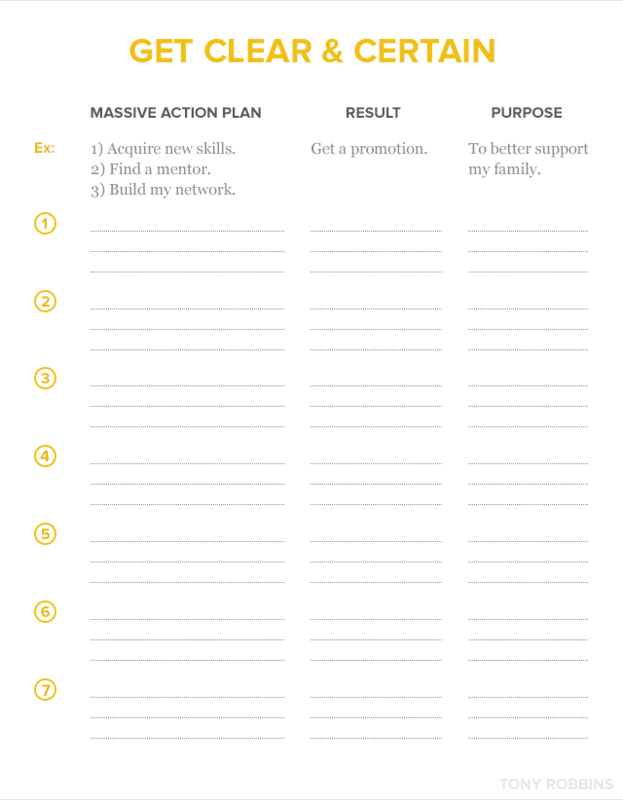 Below is his very simple worksheet that can organize you around life purpose and action.